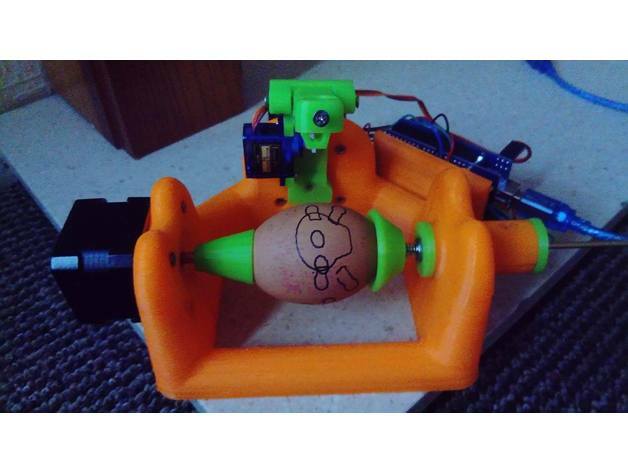 The Sphere-O-Bot is a simple 2 axis drawing machine that can draw on most spherical surfaces. You can use it to decorate balls or eggs. 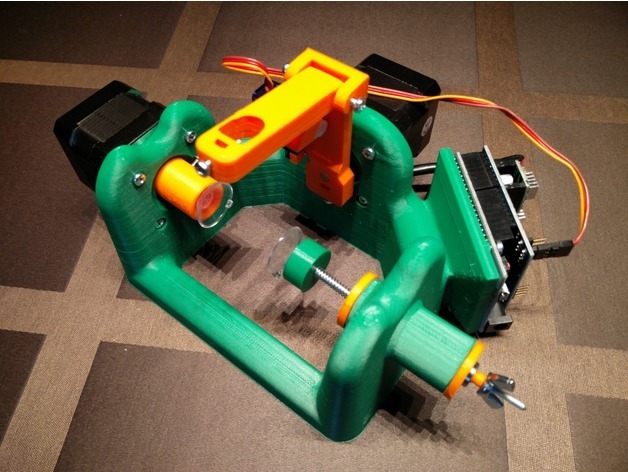 This design also features the regular JJrobots electronics (the same we have used in all our robots). 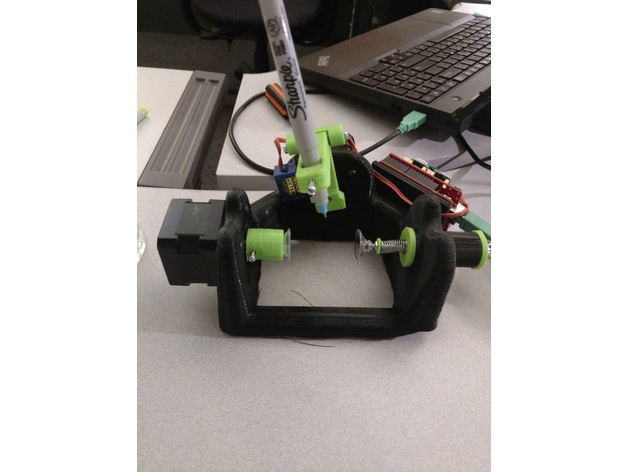 So you can create this robot or any other just simply printing new 3D printed parts and uploading the custom code. 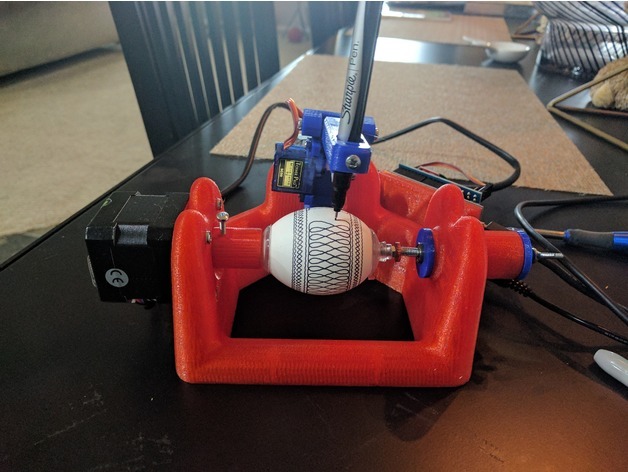 The Sphere-O-bot kit comes complete with a fully assembled and tested Brain-Shield + Arduino with its USB interface.No soldering or programming are required. The onboard 16× microstepping driver chips along with the 200 step/revolution stepper motors give a combined resolution of 3200 steps/revolution in both axes. 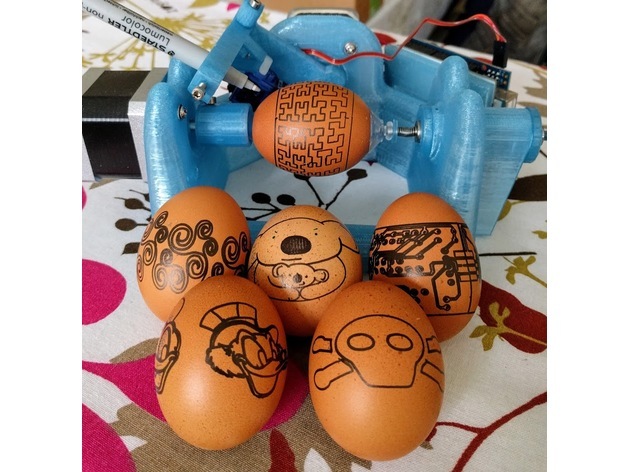 A universal-input plug-in power supply is included with the EggBot kit, as is a USB cable and one Sharpie marker. The Sphere-O-bot is normally controlled through a set of open-source extensions to Inkscape, the excellent and free vector graphics program. You can create your own drawings (Above: Wines + stars design below) or use one from the existing repository. 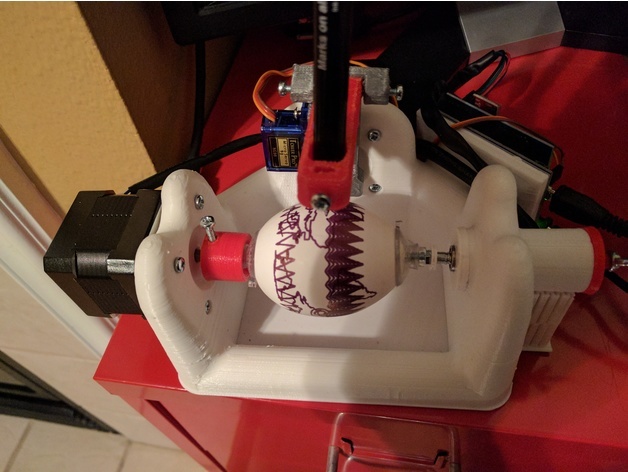 Basic operation is much like that of a printer: you import or make a drawing in Inkscape, and use the extensions to plot your drawing onto whatever object you’ve mounted in the Sphere-O-bot . It’s all handled through an easy to use graphical user interface, and works cleanly on Mac, Windows and Linux. The pen holder included with the Sphere-O-bot kit is designed to fit various art pens including Sharpie Ultra Fine Point pens. It can actually fit almost any pen of similar size. You can even fit a lot of things that aren’t pens. 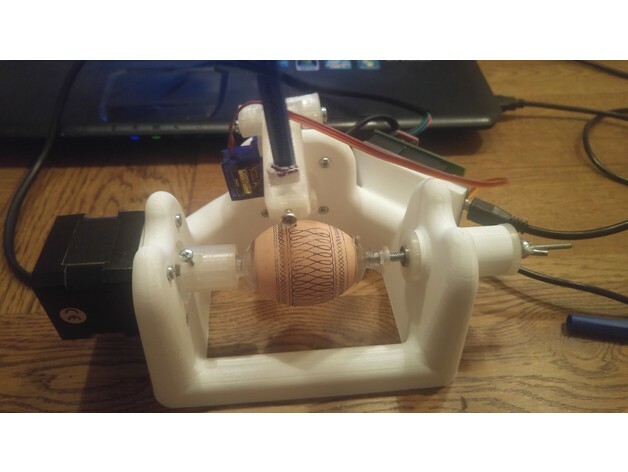 The Sphere-O-bot is an open source hardware+software project. Originally from Evil Mad Scientist (very cool robots), we have adapted the idea to our electronics and ancillary elements. 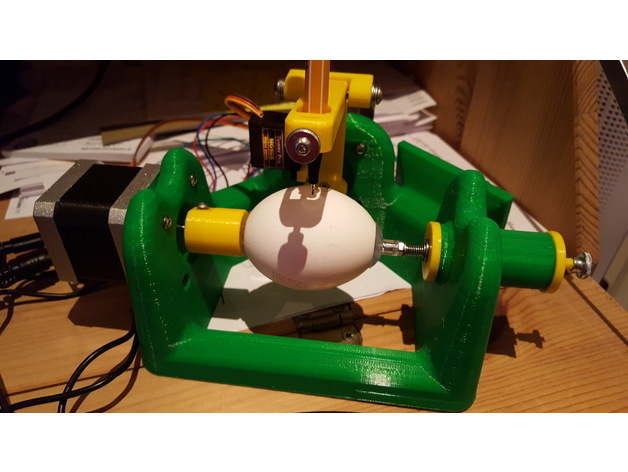 Software, designs and use is exactly the same. . Extensive documentation about the original EggBot kit is available here. The Sphere-o-bot robot shares almost all of its parts and 100% of its electronics with the B-robot EVO, the fastest -remotely controlled- Self Balancing robot, the iBoardbot or any other JJrobot . Create your own B-robot after assembling the Sphere-O-bot! I have a problem compiling until I realised I had to use Arduino IDE 1.6.5 to compile the code. Thx for the support! Great for making crafts!! Thanks jjRobots! 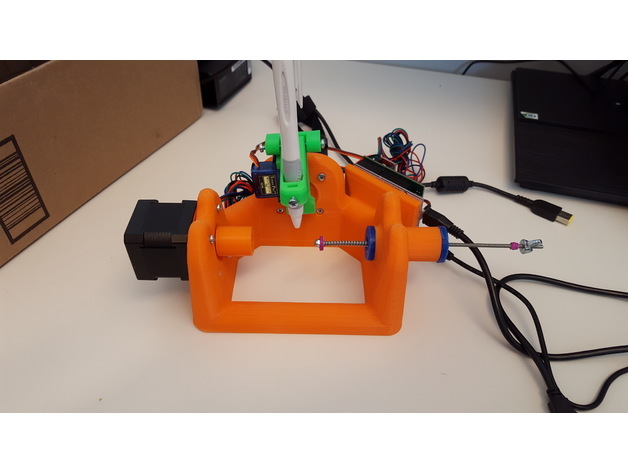 We used this for easter workshops educating kids about 3d printing, robotics and coding. Was fun to watch the creations of the kids. Unfortunately some of the eggs got smashed, so prepare some backup. I made it after assembling the B-robot EVO. It was straightforward. Thanks guys! Beside the part of printing the frame (it took 24 hours with my 3D printer) Everything is working nicely Очень хороший робот. Очень забавно рисовать мячи для гольфа) Grettings from Moscu! We have used it to paint golf balls in the club. That is not a mentioned used but worked! Trying to make my own Solar System with my niece… I guess my next project will be personalise my globe Earth. Love it!! I have some problems with my Apple computer. But checking the forum and with jjrobots support I was able to make it work. And it really draws fine! Ordered:Pick the desired Brain Shield COMBO: Brain Shield 3.0 + Arduino Leonardo + 2x stepper motor drivers. Only received the Arduino Leonardo. 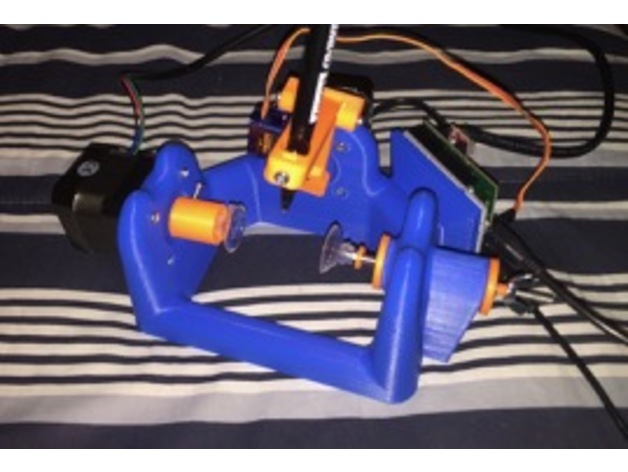 Never received the stepper motors or the brainshield.